This pneumatic training course covers the use of compressed air for pneumatic control and as a signalling medium. A complete overview is given, covering compressors, storage, dryers and distribution as well as the design, construction and operation of a range of actuators, valves and ancillary equipment. The relevant ISO symbols are introduced and included in the circuit diagrams. A strong emphasis is placed on safety and appropriate working practices throughout the course, especially during the practical sessions. All personnel involved with the design, installation, maintenance, operation and servicing of industrial pneumatic equipment and basic control systems. A general engineering background is advised but no specific knowledge of pneumatics is needed as this will be covered within the pneumatic training course. Courses take place over three days and are available in-house or at one of our national training centres. Practical exercises are used throughout the whole course. 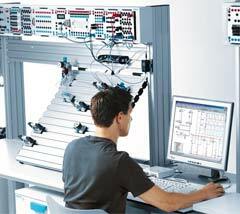 Candidates will also use FluidSIM, a Festo software package for the design and simulation of fluid power circuits. Information: For more information, or to make a booking please contact the Business Centre on (01604) 667584.